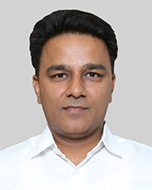 Vivek Garg is a Whole-time Director of Vikas Ecotech Limited and part of the promoter group. Vivek is responsible for driving the day-to-day operations of the company including the real-estate, logistics, administration and purchase functions. With over 16 years of work experience, he has partnered the company in building a people-focussed and customer-centric organization. An accomplished leader with in-depth business knowledge, Vivek’s role has been instrumental to the growth journey of the company. His direction has led to the setting up of efficient operational processes that are essential for the company’s growth. Vivek holds a Bachelor of Commerce degree from the prestigious Delhi University.